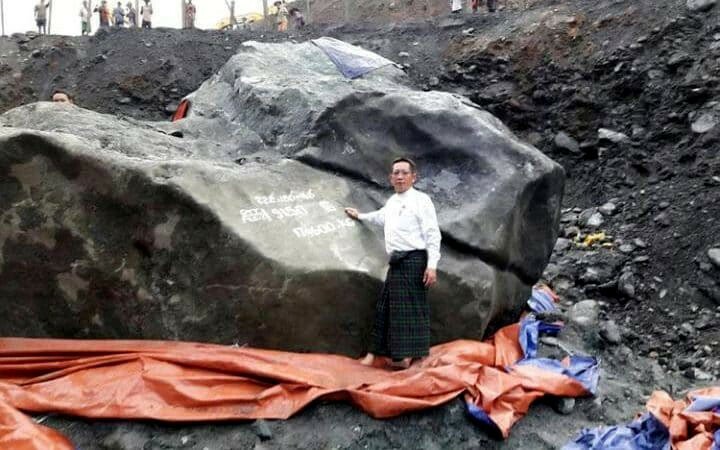 A huge jade stone weighing 175 tons has been unearthed in the Southeast Asian country Myanmar. The stone is believed to be worth £140 million and was discovered in a remote mine in the state of Kachin. This precious stone is about 5.8 meters (19 feet) long and about 4.3 meters (14 feet) high. This stone is second only in size to the carved statue at the Jade Buddha Palace in China which weighs 260 tons. Around 70 percent of the world’s high quality jade comes from Myanmar and this industry makes up around half of the country’s gross domestic product. However, Myanmar’s multi-billion dollar trade is shrouded in controversy and complaints of environmental negligence. The stone will be sent to China to be carved up into expensive jewelry and sculptures.